The indictment caps a yearlong probe into the Sept. 16, 2007, shooting as the guards’ convoy arrived in Baghdad’s Nisoor Square. WASHINGTON — Five Blackwater Worldwide security guards have been charged in a September 2007 shooting that left 17 Iraqi civilians dead and raised questions about the U.S. government’s use of security contractors in combat zones, according to two sources familiar with the case. 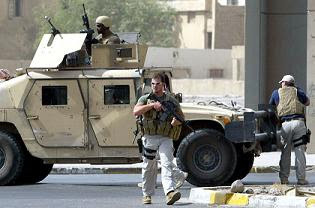 The guards, all former U.S. military personnel, worked as security contractors for the State Department, assigned to protect U.S. diplomats and other non-military officials in Iraq. Keith Olbermann speaks about Georgia attacking Russia first, Arms Dealers and Who is really benefiting from the Bailout. SAN DIEGO — Military security contractor Blackwater Worldwide is not giving up on a training facility in San Diego County, according to company officials. The company is planning to open an indoor facility in Otay Mesa. It would be housed in a 61,600-square-foot building on Siempre Viva Road, just south of Brown Field. The news comes one month after Blackwater abandoned a controversial proposal to build a training center in the far East County. Blackwater applied for the permit in February, shortly before announcing that it would drop plans to develop an 800-acre ranch near Potrero into a training camp for law enforcement. The city of San Diego approved a permit for the indoor facility on March 19. BLACKWATER KILLS NEW YORK TIMES "DOG"
BAGHDAD The U.S. embassy in Iraq is investigating another deadly shooting incident involving its Blackwater bodyguards — this time of the New York Times’ dog, “Hentish,” Reuters is reporting today. As of 4 p.m., an item on this has not yet appeared on the Times’ Web site. WASHINGTON: A new agreement between the Pentagon and the State Department gives the military in Iraq more control over Blackwater Worldwide and other private security contractors. The agreement was signed Wednesday at the Pentagon by Deputy Defense Secretary Gordon England and Deputy Secretary of State John Negroponte, whose department uses Blackwater to guard its diplomats. It spells out rules, standards and guidelines for the use of private security contractors. The agreement also says contractors will be accountable for criminal acts under U.S. law. That partly clarifies what happens if a contractor breaks the law, but leaves the details to be worked out with Congress. WASHINGTON — State Department Inspector General Howard J. Krongard, who has been accused of improperly interfering with investigations into private security contrac tor Blackwater USA and with other probes, resigned today. 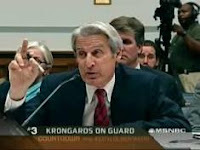 “I have nothing further to say at this time,” wrote Krongard, whose job made him the department’s chief internal watchdog. Howard Krongard told President Bush in a letter that he would quit effective Jan. 15. Blackwater Worldwide — a private contractor that protects U.S. diplomats in Iraq — is alleged to have smuggled weapons into the country. In November, Krongard was forced to recuse himself from any inquiries into Blackwater after it was disclosed that his brother had joined the company’s advisory board. In addition to recusing himself from matters related to Blackwater, Krongard also said last month he was no longer involved in corruption investigations related to the flawed construction of the U.S. Embassy in Baghdad, a $600 million project that is beset by logistical delays and security concerns.